New York-based ESI Design, with Chinese firm Atelier FCIZ Architects, constructs a building with used CD cases and rainwater that changes color based on visitors’ activity and incorporates thousands of crowd-sourced photographs. Slideshow, video inside. When the World Expo in Shanghai opens on May 1, some of America’s leading design talent will be center stage. And not just in the American Pavilion. If you want to see what state-of-the-art interactive experience design looks like, you’ll have to hike on over to the Dream Cube, which is the Chinese corporate pavilion. That’s where New York-based ESI Design, in collaboration with Chinese architectural firm Atelier FCIZ Architects, will dazzle fair goers with a building that changes color based on visitors’ activity, incorporates thousands of crowd-sourced photographs and, in an example of extreme upcycling, its 4,949 square meter exterior is made from used CD cases while the interior is cooled using filtered rainwater. Indeed, the problems plaguing the American pavilion are well-known: funding issues and conflicts over architects that have rendered the project a race to get something up — anything! — by opening day. It took extreme intervention by Secretary of State Hillary Clinton to prevent an embarrassment of global proportions. 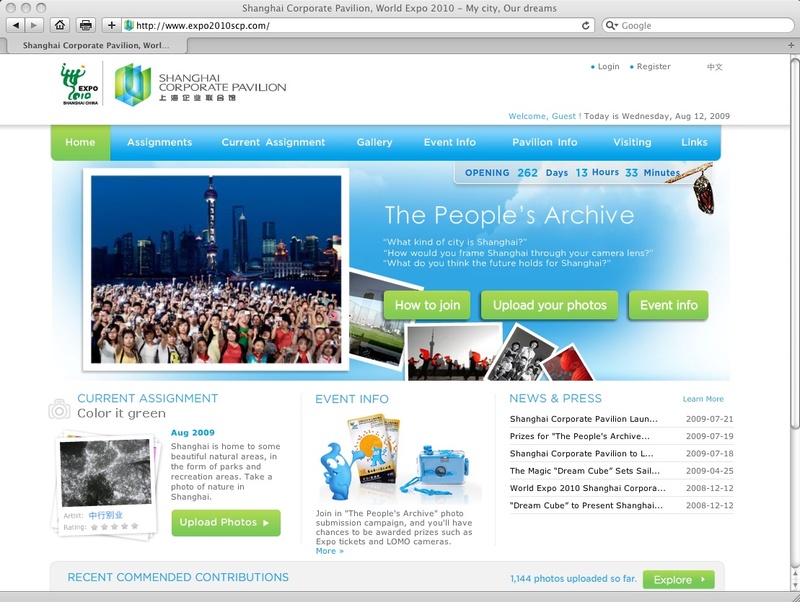 By contrast, in China, Dr. Shi Derong, Chairman of Shanghai Guo Sheng Group and the head of the Chinese corporate committee began a global search in May 2008 to find a firm that could create an interactive exhibit based on the theme “Better City, Better Life.” Corporate sponsors wanted a pavilion that showcased sustainable and harmonious urban living. That search led him to Schlossberg, who had made a name for himself doing projects as diverse as the retail design for Best Buy, the Ellis Island Immigration Museum, and the Time Warner Home of the Future. Once on board, Schlossberg was given the choice of three prominent Chinese architects as collaborators. Among them was Yung Ho Chang, chair of the the architecture school at MIT and head of Atelier FCIZ. Schlossberg picked up the phone to explain his vision, and instantly knew he had his man. “I love to talk to people who listen,” Schlossberg says, “and he listened hard.” The result was a rare level of collaboration that made the interactivity between what happens inside and outside seamless. Schlossberg, who had studied Chinese literature at Columbia, caught the next plane to Shanghai, where he visited monuments, open air markets, and the science and technical museum. He checked out the 60K square foot model of the city in the City Planning Agency. “I was struck by the idea of a collective consciousness and by the pride the corporate people had in Shanghai,” he says. The business people he met were fluent with history and literature, Confuscius, and Lao Tzu. “If I had been talking to American business people, I doubt that they’d be discussing Jefferson,” he says drily. That led him to envision a dreamscape of Shanghai as a mythical place but populated with images that Chinese people themselves could contribute. Chinese citizens were asked to contribute photos of their favorite places and of themselves with friends or family. Soon, their offices were flooded with over 20K images. Within the pavilion, those images float in space as part of a multi-layered path through the exhibit. Along the way, fiber optic tubes respond to visitors’ waving arms. The trip through this dreamscape ends up in a 360-degree theater, 100 feet in diameter, and surrounded by a 14-foot-high screen. As people gather in the theater they’re asked to clap, in a sort of Chinese Tinkerbell moment, which triggers changes in the LED lights on the cube’s exterior. People approaching the exhibit will see the whole building change color, in response to visitors inside.